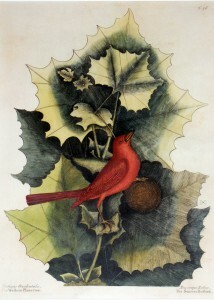 Sycamore and Tanager, 18th century, hand-colored engraving, Mark Catesby, courtesy of the Garden Club of Virginia. The beauty and variety of Virginia plant life is showcased in a three-month exhibit opening December 5 at Jamestown Settlement. “Clayton & Catesby: Botanical Virginia” explores documentation of native plants by naturalist Mark Catesby and botanist John Clayton in the 18th century and the Flora of Virginia Project in the 21st century. On loan from the Garden Club of Virginia, 17 period hand-colored engravings created from Catesby’s watercolor paintings of American flora and fauna, will be exhibited alongside a 1762 edition of Flora Virginica, based on Clayton’s work. The exhibit, which is curated by the Flora of Virginia Project, also will include tools used for studying and collecting plants, and biographies of Catesby and Clayton. Seven public programs related to the “Botanical Virginia” theme will be presented during the period of the exhibit, December 5, 2015, to February 28, 2016: lectures at 4:30 p.m. December 10, January 5 and 19, and February 2; and 10 a.m. to 2 p.m. workshops on January 14 and 28 and February 25. During seven years in Virginia, from 1712 to 1719, Englishman Mark Catesby collected plants from the region of the lower James River to the river’s headwaters in the Appalachian Mountains. He returned to America in 1722 and continued his work for four more years, collecting and drawing plants and animals from the more southeastern reaches of North America and the Bahamas. Back in England in 1726, he began producing engravings of his watercolors, later published in The Natural History of Carolina, Florida, and the Bahama Islands. A contemporary of Catesby, John Clayton was born in England and by 1720 was serving as the clerk of Gloucester County, Virginia. Clayton, a student of botany, provided Catesby and John Frederick Gronovius with dried plant specimens and compiled a catalog of plants native to Virginia. Gronovius, of the Netherlands, published Clayton’s work in Flora Virginica in two volumes, in 1739 and 1743. This and a second, 1762, edition were the first and, for more than two centuries, the only published compilations of Virginia’s native plants. The Flora of Virginia Project, begun in 2001, resulted in the publication of Flora of Virginia in 2012, describing 3,164 plant species and containing 1,400 original illustrations. The project continues with a focus on education and outreach, including a partnership with the Jamestown-Yorktown Foundation in presenting “Clayton & Catesby: Botanical Virginia” at Jamestown Settlement. The exhibit is supported with private gifts to the Jamestown-Yorktown Foundation, Inc.